Joanna and her Amazing Technicolor Interwebs: Where Do You REALLY Want to Eat? So after Kyle's and my odd "let's plan our meal reservations" conversation ended up so badly (I blame me), we talked again and worked in some of our plans for events to come up with a better dining plan. We're both going to land before lunch on the Saturday we arrive, so we decided a later dinner wouldn't hurt. Kyle really likes the Hoop-Dee-Doo Musical Revue, and I've never been before, so I decided I was game. We threw out the Garden Grill for this reservation. While I loved dining in one of my favorite pavilions in EPCOT, I am always game for something new (unless it's fruit on the entree - what's up with that food trend!?). Besides, Kyle has never steered me wrong with humorous shows! Last time I was skeptical about Yehaa Bob and the 50's Prime Time Cafe, but both were treasured memories from our last trip! Dessert is strawberry shortcake (and a fun song)! The more I read about the Hoop-Dee-Doo Musical Revue, the more excited I get! At first I had this weird Little House on the Prairie covered wagon image in my mind: kind of a on the trail, circle the wagons, have a campfire, and sing songs together event. I couldn't be more wrong, and I've never been so happy to be wrong! I can't wait to get back and tell you about this dining experience! Sunday evening we're going to go to the Candlelight Processional (just realized we'll be there on "church day", so I guess I won't be a total heathen that day). To be sure of seating to see Neil Patrick Harris narrate the event, we made reservations through the event dining package for lunch at Teppan Edo. (We're paying out of pocket for this, this is how we ended up with enough dining credits to go to the 2 credit Hoop-Dee-Doo Musical Revue.) I've never been to a Japanese Steak House, so I figure why not go to one for the first time in Japan (ok ok inside Epcot)? The menu looks like it's full of tasty choices, and every time I look at it I change my mind about what I'll order! This was another one that Kyle wanted to go to, and after reading a review on the Disney Food Blog about the Yak and Yeti, I'm looking forward to it as well. 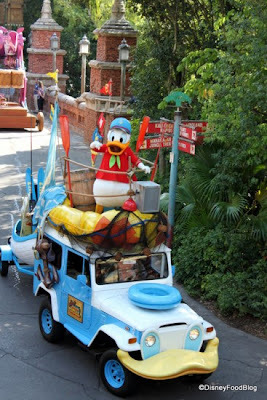 I read that if you get a reservation for a late enough lunch and ask for a table upstairs by a window (fingers crossed that all of that works out), you can see the Jammin' Jingle Jungle Parade while you eat! Since I haven't seen the parade in Disney's Animal Kingdom yet, we thought this would be a neat way to experience it, so we got a lunch reservation for 3pm. 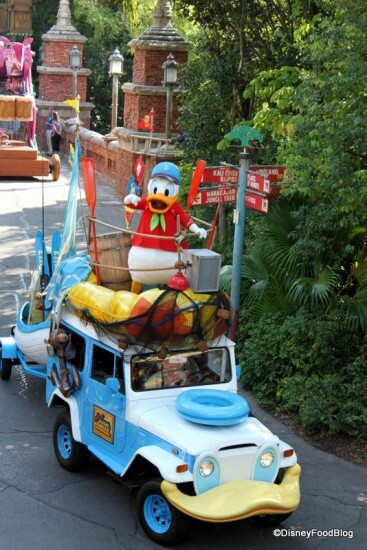 Wouldn't it be neat to watch the parade while we have our meal? I *really* hope we get to see this from our table! When I entered all of our reservations on my Disney Dining app, I was surprised at how many lunches we had decided to do. It frees us up for evening events like the Candlelight Processional, the Osborne Lights, and this evening's Mickey's Very Merry Christmas Party. Tuesday's lunch will be at the Polynesian Resort's Kona Cafe. Last trip I got to see the Wilderness Lodge and the Animal Kingdom Lodge when we went there for meals. I'm not really into hopping resorts just to see them. That said, I'm looking forward to seeing the inside of this resort! I decide to indulge in while there! I'm very unsure of the food here. I've looked over the menu multiple times, and I'm still not sure what I'll order, but the desserts all look awesome! I'm debating the Kona Kone, Kilauea Torte, and No Sugar Added Apple Stacker. I think I'll have to see what kind of mood I'm in when we get there! Which one would you choose? I'm really into traditions. Do it twice, and I'm all like "it's a tradition forever!" No joke. See where I'm heading with this? We've begun a new tradition of breakfast at Whispering Canyon Cafe on our last day of our trip! OK ok it may not be a tradition, but it does have the required Mickey waffles, and I hear they're making them with chocolate chips if you like as well! I love having a sit down breakfast on the last day in the Parks. It gives you time to get your luggage over to the drop off and make your way over to the boat to the Wilderness Lodge. Last time we had a private boat ride there which gave us some peaceful, uninterrupted time to chat while having a short tour of our happy place. When all was said and done, I think we were both happy with our dining choices. Dining at Disney is a careful dance of finding places everyone can eat at (pickiness and food allergies considered) and of exploring new places. Ya know, Kyle brings a great balance to my pickiness by encouraging me to try new things. If it were up to me, I'd go for cuisines that I'm used to like American, Italian, and Mexican food. 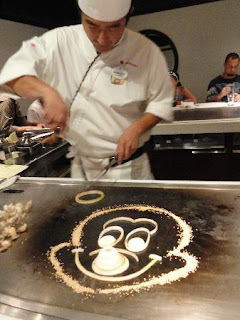 Without him I never would have tried Boma (can I say I tried it?) or most of the places we're going this trip. In fact, I tried the Morocco quick service when I was at EPCOT with my family in 2010 because of his suggestion, and we also tried the Flame Tree BBQ because of him. Both are new favorite places to eat. I guess that means I should trust his taste... it's usually spot on. Besides, he's never yet put something on my plate (*cough, cough Paul and the Pear Gorgonzola Pizza incident*) or made fun of me for not wanting to try something. :) Can't ask for a better dining buddy than that! 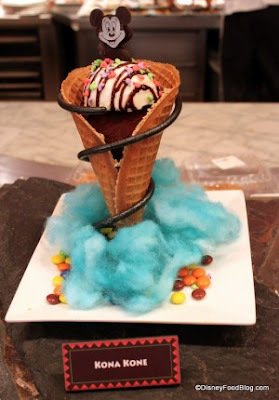 Next post: I'll keep with the food trend and share what snacks I'm dying to try this trip! What a great post! I can tell that you and I have a lot in common when it comes to Disney Dining! I have to look over the menus and decide in advance what I want to order as well. In fact, I do that almost everywhere we go to eat. LOL Great choices! Sounds amazing - perhaps... mostly to you weird people who like fruit on your entree! ew. The Yak & Yeti is really my Top 5 of WDW restaurants. We tried Tusker House in August after going to Y&Y in March, and while I thought it was fantastic, nothing comes close to Yak & Yeti. We just went this past weekend and the meal did not disappoint. You will be VERY VERY VERY full. And the wait staff is very nice! Enjoy! ;) I'm hungry just reading this! Estelle - That makes me even more excited for Y&Y! I never would have picked it without Kyle saying we should go there. I'm really looking forward to that meal. 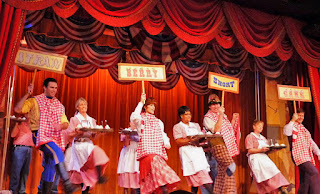 We go to Hoop Dee Doo every trip and have for the last 25 years. We just love it! It is our family tradition to eat there the last night of our vacation. So much fun! Looks like you have a great line up! Teppan Edo is probably my favorite place!! It is delicious and the atmosphere is A LOT of fun. Also try the white sauce it is to DIE for haha. I like to call it the yummy sauce. Have fun! !